Canon's new LV-7590 lerge-venue projector offers a brightness of 7,000 lumens. 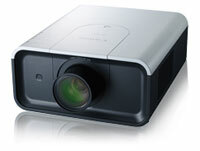 Canon has launched a new high-brightness LCD projector for use in school auditoriums and other large venues. The new LV-7590 offers a brightness of 7,000 lumens, coupled with an XGA resolution (1,024 x 768) and a contrast ratio of 1,600:1. It includes 10-bit digital video processing and automatic gamma correction, a technology that monitors the brightness on each frame and changes gamma levels to increase clarity and sharpen text. Five optional lenses are available for the new unit, including long focus zoom, ultra long focus zoom, ultra wide angle, wide angle zoom, and 1.3x zoom. Support for both 4:3 and 16:9 aspect ratios. AV ports include 5BNC, DVI-D, component (RCA), RGB in and out (15-pin mini D-sub), S-video, composite video (RCA), and stereo audio minijacks in and out. Control and networking ports include USB and RS-232, as well as an optional RJ-45 port. The projector is available for $8,999. Further information is available here.